After ascending Pyramide du Tacul and the Contamine couloir on the North Face Triangle of Mont Blanc du Tacul from the Cosmique hut we drive through the Mont Blanc tunnel and taken the lift up to the Torino hut. After a good night sleep we wake up early and walk the easy 2 km to our target: The North Face of Tour Ronde. It is a beautiful morning and as we approach Tour Ronde the mountains are painted in a red glow. Carsten on the approach to Tour Ronde. Move the cursor over the picture to see the ascent and descent routes. Due to the easy access and relatively easy grade (for a North Face...) the route is very popular. 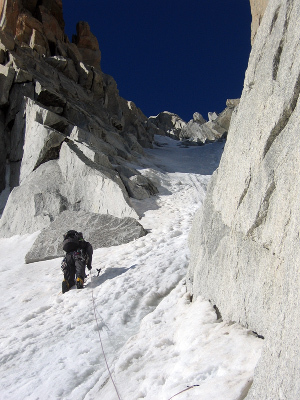 We have heard stories of fatal accidents caused by incompetent climbers falling into climbers below (!) and we thus cross our fingers, hoping none or only a few parties will be above us. As we get closer we can see several parties in the area, but luckily only one rope team has chosen the same objective as us. The North Face of Tour Ronde with the bergschrund clearly visible. Move the cursor over the picture to see the route and the two climbers (circled). We make our first anchor just before the bergschrund which I lead. It is an awkward climb and as usual the 'schrund is more or less impossible to protect, but I get above it and can then reach the rock on the right where I set up a rock anchor. Luckily, the party above us seem competent and climb fast, so they do not cause any delays or rock (or climber!) falls. Hans negotiating the first crux: the bergschrund. We follow the rocks on the right at the lower face and note several rock falls. It is already getting quite hot even though we are on a north face! We consider to bail, but given that most of the major rock falls well to the left of us we decide to continue. Hans at the beginning of the couloir in the middle of the face. 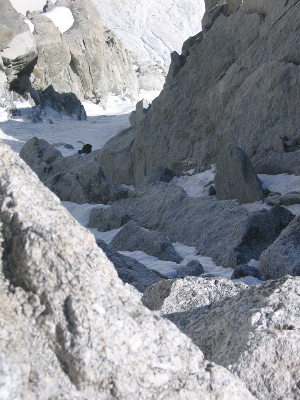 The crux rock band is seen above the couloir. 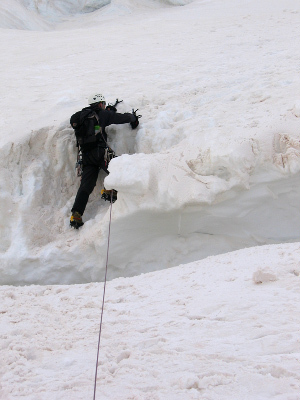 The face has two large ice/snow fields separated by a couloir ending in a rock band. The average angle of the slope is 52° - the lower part being the steepest. 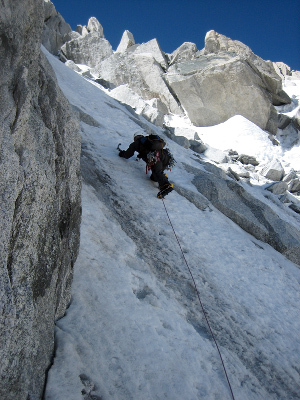 As I reach the end of our 70 meter rope on the third pitch I am in the middle of the couloir. We now switch from belaying from the rocks on the right to the rocks on the left. From our belay we cannot see a clear weakness in the rock band above, but there seems to be a weakness on the right. However, snow released by the sun or climbers above is constantly pounding down this weakness so it does not look very attractive! Carsten leading the upper half of the couloir and the crux rock band. Carsten takes the lead and climbs up to the rocks and then he disappears out of my sight to the left. 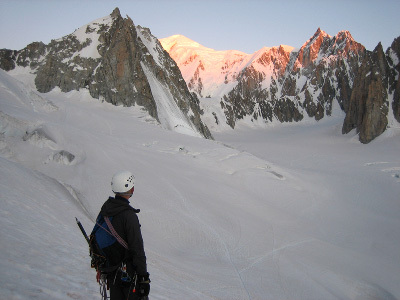 He yells that he has discovered a narrow couloir mixed with snow, ice and rock which he chooses to climb. Carsten looking down on the rock band, with Hans following in the distance. Soon I follow into his footsteps and enjoy the mixed climbing of the couloir, which has not been too easy for Carsten to protect! Carsten belaying from the top of the rock band. As you can see it was a (too) hot day for climbing the route. Not easy to see that we are on a north face! 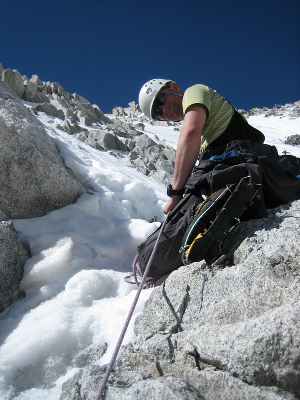 Hans following the rocks on the left of the upper face in order to stay in the shade (=stable snow/ice). 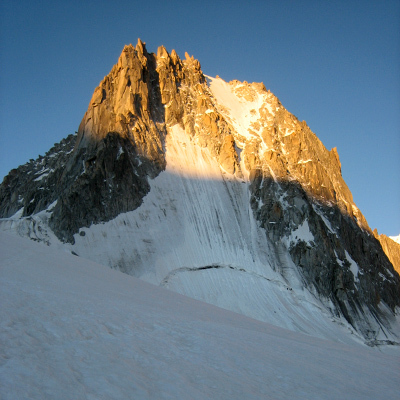 The summit of Tour Ronde is a small rock tower, which can either be climbed directly (grade IV) or circumvented by an easy (but slightly exposed) traverse on the left. 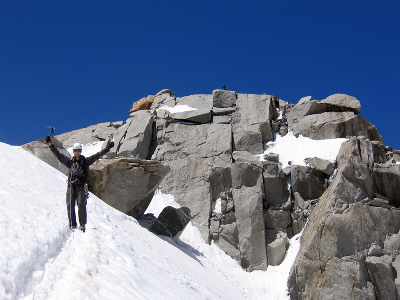 Most people make the traverse and then walk/climb the 30 meters to the summit via the south-east ridge. 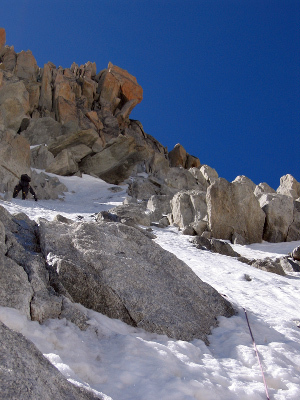 descend immediately rather than doing the easy 30 m climb to the summit. 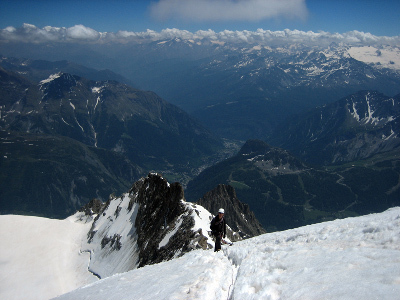 Albeit the view from the summit should be one of the finest in the range with stunning views of the Peuterey Ridge and Brenva Face we decide to descent immediately via the south-east ridge - it is getting too hot and the descent will also be exposed to rock fall. At the Col Freshfield we dive into the couloir on the left, which we partly rappel and partly downclimb. It is not amusing as the warm snow is quite unstable, but we get back to the glacier in one piece and walk with a smile back to the Torino hut. Carsten on the descent. The south-east ridge is seen behind him.